Before lunch there were some talks. They explained all about Firefox OS, the new operating system for mobile phones that is just starting. The objective of Mozilla and Telefónica, their partner in this project, is not to compete with the best Android and iOS devices, but to replace feature phones. At least for the moment. After lunch there was a hackathon of Firefox OS apps. Working on teams we had to create some application for Firefox OS in one of the 5 categories for the contest. Our idea was Groupot, an application to manage the accounting in groups, and it only fitted in the Open Category. It was possible to have some work done before the hackathon day, so we started the application the week before, but most of it was created during the 3 hours of the hackathon. Groupot allows you to manage the accounting for groups. Instead of paying everything between everyone or putting money for a pot that is then used to pay, Groupot takes note of every payment and then sends a summary of all the expenses and the suggested payments to settle all the debts. Payments in a Groupot event can be for the whole group or just for a subset of the users. After the 3 hours of the hackathon there was a demo of every project. At that point we had Groupot working with all the functionalities needed for an event: creating an event, adding users, adding payments and getting the summary and optimized payments to settle the debts. We still have a lot of work to do to improve it, but it already solves the problem it was created for! Groupot is open source, go check it out at https://github.com/buongiorno-ffos/groupot. We’ll share a link to the application in Firefox OS Marketplace and Appsfuel when they are published. After all the projects were demoed the jury announced the prizes and Groupot won the Open Category :-D. I can’t remember the winners on all the categories, they will be in movilforum blog soon. There were a lot of good apps and ideas! We won a Geeksphone Peak. I’ve been already testing it and I like the phone and I think the idea of using web applications for the OS is good. I still miss a lot of applications in the Marketplace, but they are just starting and that’s why they are doing these hackathons, to get developers doing apps for their Marketplace. 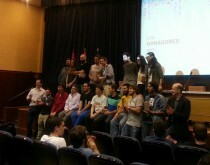 « 3 words a day – Spanish Chrome Web Store contest winners!